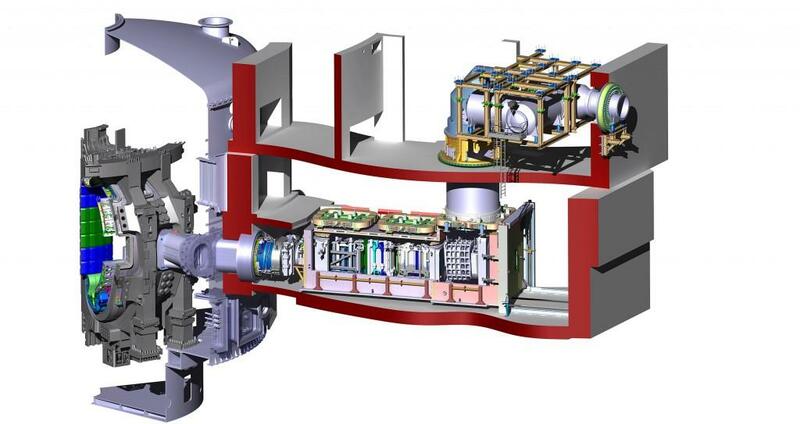 The largest fusion device ever to be built looks like a mere appendage to the much larger neutral beam system whose injectors are sized like steam locomotives. In yellow, the diagnostics neutral beam; in light brown a third possible heating neutral beam. 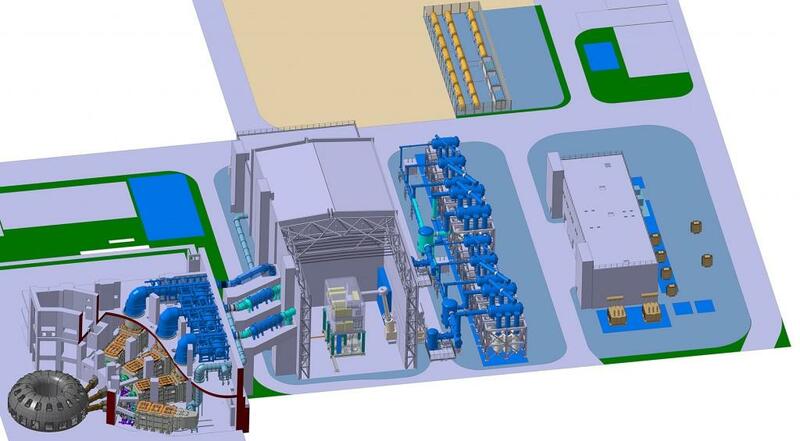 The green and blue structures to the left belong to the other auxiliary heating systems, the electron cyclotron resonance heating (ECRH) and ion cyclotron resonance heating (ICRH). Construction work underway in the Tokamak Building already gives a sense of how big the equipment for the neutral beam system will be. Giant circular cut-outs in the rebar at level 3 (L3) of the building—more than 3 metres in diameter each—will provide the passageway for high-voltage "bushings," which allow electrical power, cooling, and other services such as diagnostics to reach the neutral beam injectors hosted below. Just below the bushings, a vast, cavernous space has been reserved for the neutral beam cell where the beam injectors will be located. The largest devices (the heating neutral beam injectors) are sized like steam locomotives—25 metres long, 5 metres high and 5 metres wide—with a chimney-like bushing reaching up 9 metres to connect to the openings on the third floor. 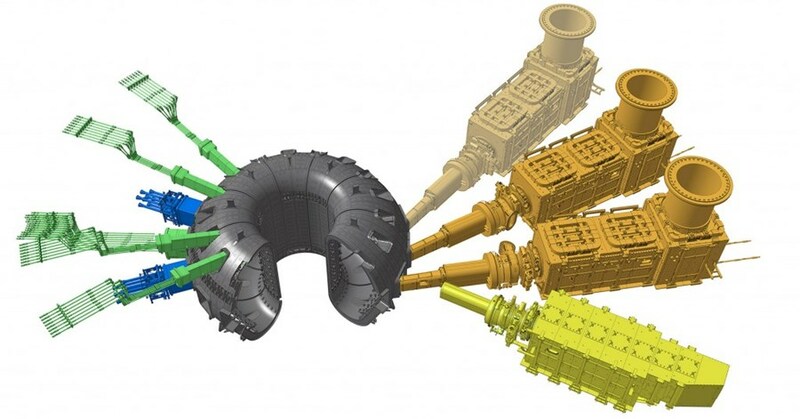 The injectors will be connected to the Tokamak at L1 level—exactly across from the Tokamak's mid-plane and the equatorial port openings. At the entry end of the heating neutral beam, a beam source generates the electrically charged deuterium ions that are accelerated through a succession of five grids (each separated by a 200 kV electrical potential) to the required energy of 1 MV at the exit end of the beam source, a "neutralizer" rips them of their electrical charges to become "neutrals," allowing them to penetrate the Tokamak's magnetic cage and, by way of multiple collisions with the particles inside the plasma, raise plasma temperature to the point where fusion reactions can occur. The heating neutral beams are designed to be able to operate during the entire plasma duration, up to 3,600 seconds. Generating a 1 MV beam that will deliver 16.5 MW to the plasma requires a unique power infrastructure. Located just outside the Tokamak Complex, two large buildings will host the transformers, the AC/DC converters and the vast high-voltage hall that will feed power to the neutral beam system by way of transmission lines entering the Tokamak Building through the "north wall" at the L3 level. Located in the vast, double-level neutral beam cell at the "ground" level of the Tokamak Building, the beam injectors are sized like steam locomotives—25 metres long, 5 metres high and 5 metres wide—with a chimney-like bushing reaching up 9 metres to connect to the openings on the third floor. 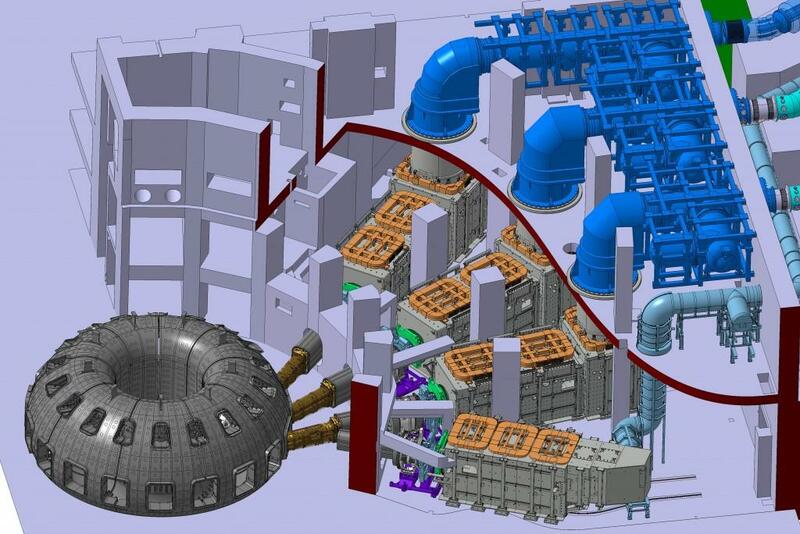 The neutral beam injection system occupies three levels of the Tokamak Building: L1 and L2 for the cavernous neutral beam cell, and L3 for the high-voltage bushings. Building contractors are working now on the large openings in the L3 slab that will allow electrical power, cooling, and other services such as diagnostics to reach the neutral beam injectors below. 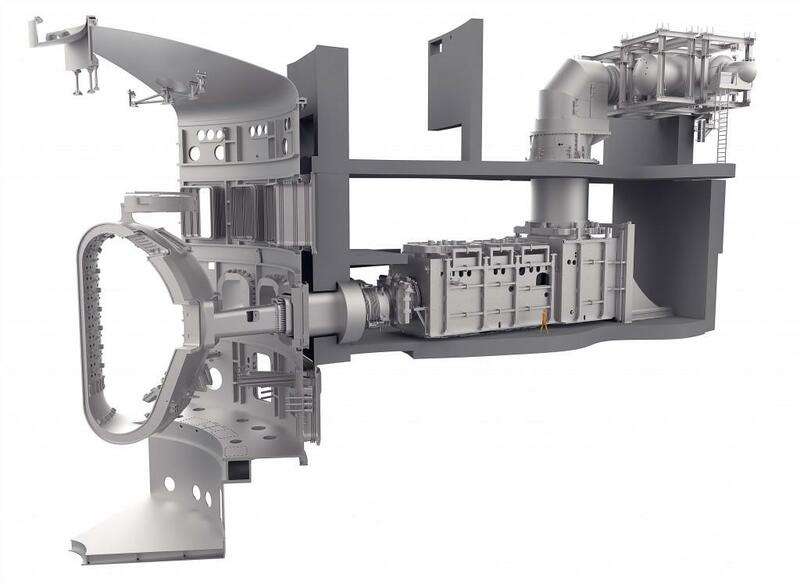 Taken together, the elements of the neutral beam system—heating neutral beam injectors, diagnostic neutral beam, high voltage bushings—dwarf the ITER vacuum vessel, making it seem like a mere appendage. Generating a one million-volt (1 MV) high-voltage beam requires a unique power infrastructure. 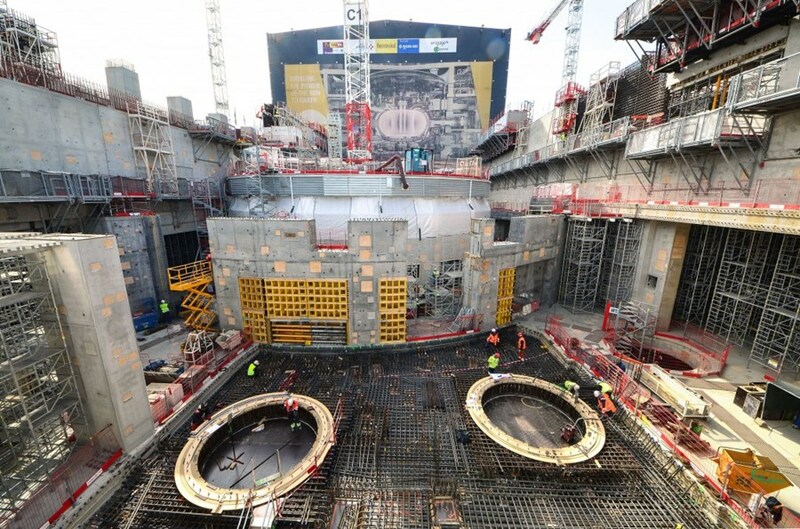 Situated along the western edge of the ITER platform, right in front of the Tokamak Complex, the infrastructure will convert the AC current from the grid into DC current, and distribute power to the neutral beam power sources, accelerating grids and ion sources. One of the most spectacular devices in this set of installations is the high voltage deck (centre) whose prototype is being tested at the ITER Neutral Beam Test Facility in Padua, Italy. Standing 6 metres high and looking like a science-fiction contraption, the device is an electrically insulated box that hosts the 1MV power supplies for the neutral beam injectors' ion sources and extraction grids.